Now that it looks like crude oil has bottomed, let's check out the charts and indicators for XOM. In last night's Lightning Round on Mad Money, Jim Cramer replied to a viewer about Exxon Mobil (XOM) . "This one has finally gotten cheap. With a yield of 4.5% I'd be a buyer." Let's check out the charts and indicators for XOM now that it looks like crude oil has bottomed. In this daily bar chart of XOM, below, we can see a relatively sharp price decline from early October to the end of December. Prices tumbled below the declining 50-day and 200-day moving averages. The 50-day line moved below the 200-day line in early December for what is commonly called a (bearish) death cross. The price action looks bearish but now look at the On-Balance-Volume (OBV) line and the volume spike in late December. The OBV line remains steady in October and November and only in December does it move lower. This action suggests that investors in XOM held their positions for the most part and then in December we see some selling and liquidation. The volume surge or spike helps us to see the price reversal below $66. In the lower panel we see a crossover to the upside for the Moving Average Convergence Divergence (MACD) oscillator. This is a cover shorts buy signal. In this weekly bar chart of XOM, below, we can see a long decline. The slope of the 40-week moving average line has been bearish since early 2017 and it is still pointed down. During the decline the weekly OBV line actually trended higher suggesting that buyers of XOM were more aggressive and acted as scale down buyers. The OBV line does decline in November and early December but it has since rebounded. The weekly MACD oscillator has begun to narrow below the zero line and could cross in the weeks ahead. In this Point and Figure chart of XOM, below, we just look at price changes or reversals and ignore volume and small price jiggles. This chart is projecting an upside price target of $81.67. Bottom line strategy: Cramer and I are on the same page today with XOM. 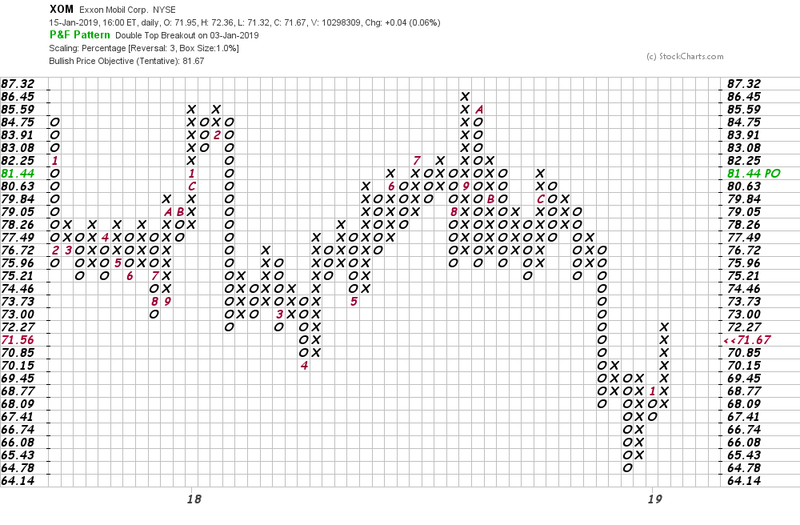 There's an attractive yield and an upside price target from the Point and Figure chart. Aggressive traders can buy XOM here and risk below $68 looking for $82 on the upside.